IMPORTANT UPDATE: This is a mea-culpa that also happens to confirm this article’s entire premise. Apple News syncing does work. But it was OFF by default on all my devices. After installing the iOS 12.2 update a NEWS toggle appears under Settings>User (name at top)>iCloud. Once enabled on all devices, the Apple News contents syncs as it should—including all those loved/followed magazines in News+. So while I’m keeping the post as is for “posterity”, you can dismiss all references to that specific problem, including screenshots (boy was that a lot of time wasted). That said: 1) the process to add magazines remains just as convoluted and 2) this is a perfect example of a small detail entirely derailing the whole experience. On three devices (one iPhone and two iPads) News iCloud syncing was disabled. On Cynthia’s iPad Mini however, the toggle was enabled as it should. I’ve yet to understand the inconsistencies but it certainly runs counter to any “attention to detail”. I’m glad it now works though: huge improvement. Rant time. Apologies in advance guys. I’ve been diving into the new Apple News and needed to share some thoughts about it. Ok, quite a few thoughts actually. No, I’m not claiming any sort of satanic conspiracy between Apple and the Horned One. I’m referring to those pesky details...as in the-devil-is-in-the. Because three words—attention to detail—appeared constantly, typed at the top of every summary slide Apple proudly beamed across the universe during their Showtime event last week. Now before we go on, I have to admit I fully drank the Kool-Aid this time around—huge gulps of it, no straw (1). I did cringe during the awkward blackouts and stilted dialogues/monologues of those “Oscar Night” segments, but overall the event made me excited. Not about spending more hard earned dollars on yet more streaming content, but about finally seeing the glimmer of a coherent strategy from a company I’ve followed for so long. I may not agree entirely with the direction, I may long for the days when Apple was synonymous with professional creative work—empowerment for anyone, not just the glitterati. But at least they finally laid out a vision that made a lick of sense. It’s slightly creepy mind you, but it makes sense. The attention to detail part however...that stuck with me. Because if there’s one element that’s made me sour considerably on the company these past years, it’s this increasing lack of attention to details. I’ve written previously about Apple Music and the situation hasn’t changed one iota: just last week a “Love Songs” playlist appeared in my For You feed, full of pop ballads and artist I’d actively marked DISLIKE. Songs from a genre I’ve specifically disabled over and over again in an ever futile attempt to train this stubborn app. This is so 101 I’m just lost for words: don’t like pop=don’t suggest pop. It can’t be that hard. So when Tim Cook speaks of human curation I basically want to get that person’s number and unload a whole stream of expletives. So you’re the one in charge of my music...hmm, let’s have a quick chat shall we? Details mean an experience that is so seamless it becomes invisible. It means never fighting the UX, never being pulled away from the virtual bubble we’ve entered. Fluidity. I was a Texture subscriber for a couple of years—the company Apple acquired to build their News+ service. So none of this is new for me: the concept of paying a monthly fee to access a catalog of magazines is something I’ve enjoyed in the past. In fact in terms of content (in Canada at least), News+ is pretty much a carbon copy of Texture. But what a mess this app is in its current state. 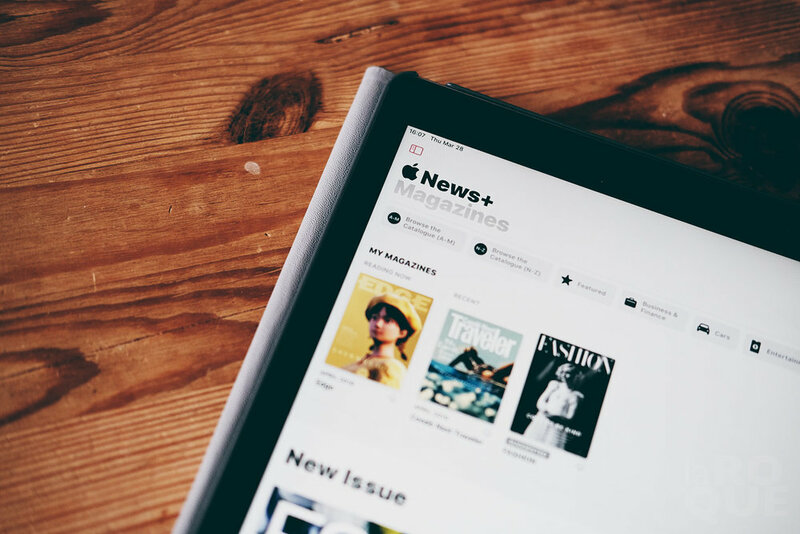 Where Texture was a single purpose proposition, solely dedicated to browsing and reading individual magazine issues, News+ integrates with the rest of the News app content...complete with an updating/non-updating mishmash of a feed. Some of the content can be customized and re-ordered, some of it can’t. There’s a For You section (ring a bell?) that pulls from topics and publishers you Love (ugh)...and then further down the page there’s a More For You section. Really? For You and More For You?? But wait, it gets better: do you know what’s below More For You? Yes! Another For You...with different content! It’s like russian dolls. Super fun and quite elegantly designed (?). I was listening to Shawn Blanc recently, talking about the notion of reading media that contains boundaries, as opposed to a never-ending rabbit hole from which we can never emerge. This is a deliberate rabbit hole to which there is literally no bottom: it’s an endless scroll of repeating topics and sections ad nauseam. For You should be ONE section that proposes a finite number of articles. Updated say twice a day—morning and evening. This current implementation feels like Apple trying to be Facebook. Adding constant noise to our lives shouldn’t be a goal—it’s also quite far from clear and concise design. From my News+ page. How many more times must I tell them I don’t want sports? News+ on the other hand is solely about magazines right? So why do I still get topical sections with content that isn’t associated to an actual magazine (Vox for instance)? And why is this content not following my preferences? Even more damning: there is no manual curation of magazines. This is nuts. In Texture you could select any number of publications that would then show up as part of a separate personal library. News+ has a My Magazines section but it’s completely erratic—so erratic that I’ve yet to figure it out. There’s an algorithmic Reading Now area that only shows the very last magazine you’ve opened. Then, there’s a Recent area that shows...other magazines that were opened...recently? Honestly I couldn’t believe such a huge design failure from Apple so I figured I was misunderstanding something. I searched and searched for a way to add a publication to My Magazines and I finally thought I’d found the answer: clicking on the title of a publication inside a specific issue would load its full catalog, complete with that dreaded heart symbol. Love is in the air, always. When I tapped the heart a message appeared telling me articles from this magazine would now appear in my News feed. Not at all what I wanted. But when I went back to My Magazines, there it was: the latest issue of that “loved” publication was now part of the Recent section. 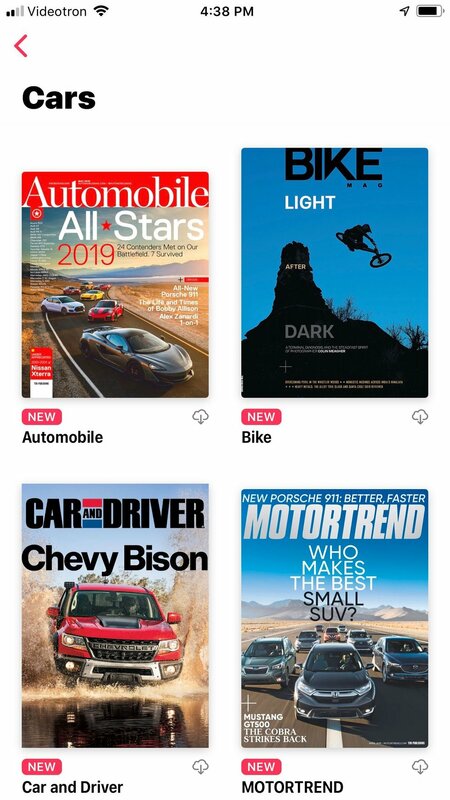 So I browsed the entire News+ catalog and added every magazine I wanted to see on a regular basis and sure enough: they all dutifully appeared in the Recent section as well. Solved. But let’s step back for a moment. First of all, this is a basic feature hidden away behind ten thousand layers: adding magazines should be the most obvious function in the News+ catalog, visible beneath every single thumbnail and labeled as such. It’s not—not even by a long shot. Second, the messaging is confusing as hell: I’m in News+, I’m accessing magazines but I’m told stories will be added to my feed. That’s Apple News. News+ is meant as another way to consume content, based on full, individual issues of a publication. I’m not looking for disjointed Flipboard tidbits—I’m paying to access magazines in their entirety. Glitch? I hope so. But attention to detail? This is beyond inconceivable. It’s beta level. I’m also back to the drawing board, with no way to create a customized library of publications. I’m on the one-month trial of News+ and I want to keep subscribing. I love magazines, I love having the wealth of access to curated information and design and images. Sure, the web...but I still enjoy the idea of a finite object in time, assembled with a singular vision. The same reason I still prefer albums over individual songs. It’s probably generational. But the experience right now is reminding me a whole lot of Apple Music: instead of joy I’m feeling frustration and a rather large dash of resentment. I want to see the person in charge and ask them what the holy f^$ is going on. 1) A few days in, after “loving/following” several publications, I’m still seeing the new issue of Essence. And the new issue of Parents. This is product placement, not at all personal curation. 1.1) I also get a large preview for a new issue of Hockey News. I’ve blocked Sports in the app, no change. I’ve disliked this entire magazine. No change. Again, product placement. 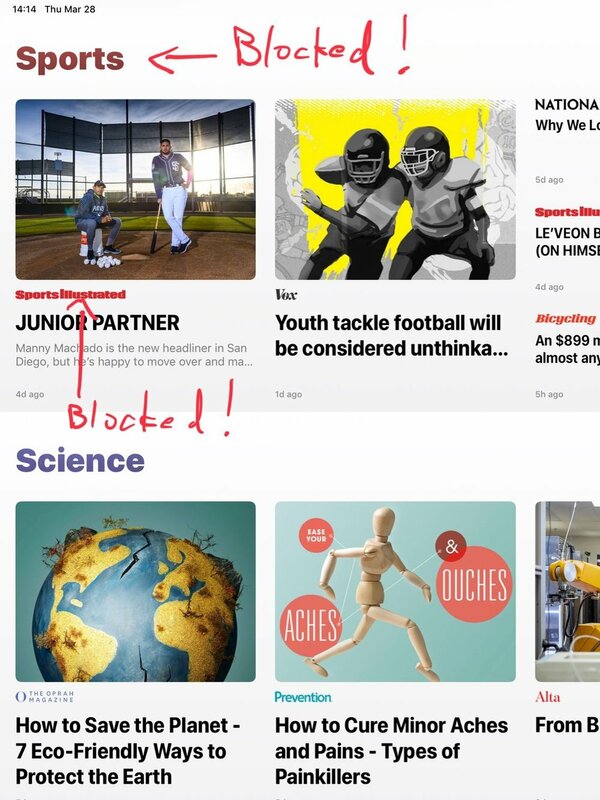 Oh and sports are still all over my Apple News feed...even if the topic is blocked (same as News+). 2) There are magazine categories listed in News+: Hobbies, Cars, Food etc. But the magazine Computer Music is nowhere to be found and is only visible when browsing alphabetically. And the magazine Bike is only found under Cars. Ok.
3) Speaking of browsing: you have to browse either A-M or N-Z. Really? Texture had a single catalog view and just as many magazines. How about a tappable alphabet at the top of the catalog? I know, twenty-six letters...call me crazy. 4) On my iPhone I’m still seeing banner ads for News+, even though I'm already subscribed (and against Apple’s own ad guidelines?). Plus, tapping this doesn’t even recognize my account: I’m sent to the same initial landing page, with a button to begin my subscription. ﻿Uhh...that last bit....why? As part of my attempts to figure out My Magazines I manually downloaded a few, thinking this would obviously force some sort of refresh. It didn’t. The downloaded magazines never appeared anywhere. And now I learn they will apparently be on my iPad...forever? Until I reformat the device? Can I delete the app and recover the space (3)? Who knows? And what exactly constitutes “limited” storage, what’s the threshold? There is simplicity...and then there is inane crippling. Texture had a section in the app where you could see all downloaded issues. It had an ellipsis next to each one that offered a quick way to remove it from the device. You know what? I’m pretty confident most of us could live with such radical complexity. Apple used to offer elegantly disguised power. Layers to explore as we became more adept and knowledgeable. Now they seem hellbent on removing anything Aunt Petunia won’t understand (4). I sincerely hope these issues get resolved and what we’re seeing are initial hiccups. I hope this isn’t Apple Music 2.0, lingering on the vine as “good enough”, despite so much potential and so many shortcomings. I hate to say this but for all the talk about machine learning and personal suggestions and privacy, both Apple Music and Apple News+ make me feel hostage to content I absolutely do not want to hear or see. And I keep telling them I don’t want to hear or see any of it...but they still shove it in my face, regardless of promises. Yes, I can dig through it and pretend it isn’t there but this isn’t at all the experience I expect from Apple. And if these are the results of human curators...just give me an A.I, please. Attention to detail needs to be more than words on a slide. There’s a long, long way to go at this point. Finally seeing Apple News in Canada after so many years helped fuel my initial enthusiasm. Getting News+ was also good to hear. But as in all things these days: our KAGE publication that’s been available on the service from the very beginning is inaccessible in Canada. I get an error stating it isn’t available for this territory. Which is obviously not the case as this is controlled through News Publisher and all territories are selected. I need to contact support but again: what the...? I deleted the app and re-installed it. I imagine the downloads are gone because EVERYTHING is gone: followed channels, blocked and loved topics, history, saved stories you name it. There is no iCloud syncing whatsoever. Beta? No, alpha. Apologies to all tech-savvy Aunt Petunias.